Digital artists and photo editors won't want to miss this Black Friday deal. Digital artists and graphic designers have been spoilt for choice with 2018's Black Friday deals, and these Wacom tablets are the latest discounts to grab our attention. You can now save over 30% on medium Wacom Intuos Pen tablets in a choice of two colours if you buy from Amazon. This means that you can now pick up one of these devices for just £109.99. At these prices we don't expect stocks to last long, so don't hang around - if you like the look of it, order it! 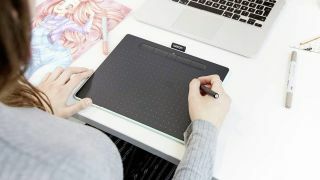 The Intuos Pen Tablet is a new device from Wacom that enables digital creatives to sketch, retouch photos, and share their work with colleagues and clients. And seeing as it comes supplied with either Corel Painter Essentials 6, Clip Studio Paint Pro or Corel Aftershot 3, you'll be armed with everything you need to start bringing your art to life. Also included in this deal is a 4K battery-free Wacom pen. When paired with the tablet's 2,540 lpi resolution, the stylus' 4,096 pressure levels enables you to work with incredible accuracy. Equipped with Bluetooth 4.2 connectivity, the Wacom Intuos Pen Tablet is compatible with Windows 7 or higher and anything above OS X 10.11. If you're interested, bear in mind that you've only got today to snap up the Wacom Intuos Pen tablet at this amazing price. Save: £51.28: Ideal for sketching, animating and retouching photos, the Wacom Intuos Pen tablet allows you to work with precision and confidence thanks to a sensitive surface and good battery life. Save: £57.19: The pistachio variant of the Wacom Intuos Pen tablet delivers everything you'd expect from the device, plus it gives your workstation a lovely injection of colour. If you're looking for your first 'proper' pen tablet, you can't go wrong with these models. Popular with digital creatives thanks to their slimline design and sturdy build, the Wacom Intuos Pen tablets are intuitive to use and save you worrying about battery life. And at this knock-down price, you can't go wrong. Still not certain if this is the Wacom device for you? Fret not. We've rounded up a whole range of Wacom Black Friday deals to help you find the perfect drawing tablet.